VEGGIEDENT® Tartar Control Chews for dogs are vegetable-based chews that work with a dog's chewing action to freshen breath, reduce plaque, and decrease tartar formation. VEGGIEDENT® Tartar Control Chews for dogs are vegetable-based chews that help to clean teeth and freshen breath when chewed once a day by dogs. VEGGIEDENT® chews are highly palatable and have a tough, chewy consistency that dogs love. The unique Z-Shape design helps to mechanically remove plaque from in between teeth as well as making the chew easier to grip. If you already brush your dog's teeth, the chews can help to maintain a clean mouth and fresh breath on the days you are unable to brush. Vegetable-based (no animal-origin ingredients), and wheat-gluten free. Formed in an easy-to-hold Z-shape design with a tough, chewy consistency. Corn starch, soy protein, rice flour, palatable agent, corn derivative, chlorhexidine. 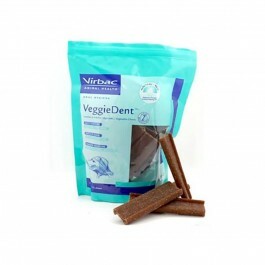 VeggieDent Extra Small Chews are intended for dogs less than 5kg. Give one chew per day. VET AQUADENT® is an easy to use drinking water additive which helps to fight dental plaque and tartar formation in dogs and cats. The KONG Dental has special grooves that clean teeth and gums as dogs chew.